Parts Washer Service from StingRay is professionally provided by MART Tech Services. This independent company has Customer Care and Service as their only mission. You will not find a better Part Washer Service organization anywhere. MART Tech Services maintains an extensive inventory of repair parts for every StingRay model. Making sure users keep their StingRay Parts Washer up and running 100% of the time is of the utmost importance to us. Our mission when a StingRay parts washer needs repair or service is to provide complete satisfaction and to "delight our customers". Any time a StingRay needs service or repair work our end user is encourage to contact Tech Services for advice. Customer Care Telephone support and diagnostics is Free. Our experience with thousands of parts washer repairs just likely includes one like yours and our service technicians can quickly help you identify the issues and get your machine back up and running. Our in-stock inventory is available next day so that you do not need to search for parts and our on-line photographic parts display and exploded view drawings make it easy to select the exact part you need. Our liberal warranty policy provides approved Warranty repair parts, shipped next day air, without waiting for the return of the defective parts. StingRay Repair Parts are IN-STOCK and include SAME DAY SHIPPING. In stock OEM parts for same day shipment keep your washer operating day-in and day-out. Our Factory Trained and Experienced Service Techs answer our telephones to help you immediately with your questions, provide expert troubleshooting help, provide warranty service, and offer chemical solutions or answer general parts washer questions. Telephone diagnostics gets your machine back on line quickly and without the expense of a service call. 24 hours / 7 days a week Website Support. The MART Tech Support website is unique. Our support website is packed full of detailed Repair and Replacement parts pictures as well as exploded views for easy part selection & identification. The Chemical section teaches methods for selecting the right chemistry, keeps you in compliance with downloadable MSDS and explains how to titrate your solution. The Retrofit page explains available updates for your machine. Owners interested in a service visit or start-up & training can explore the benefits under Training/Start-up. Lost your operating manual? Download a new one for Free in our support section. 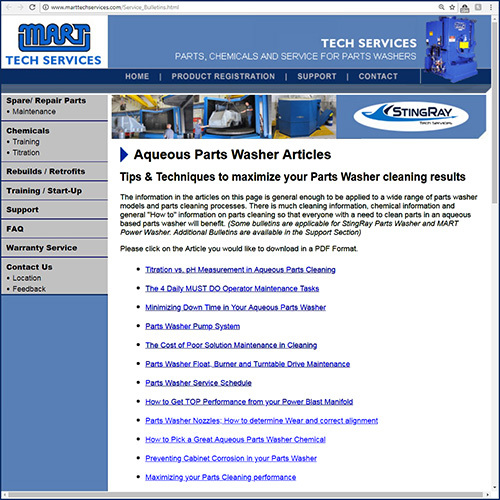 Free Email tips and techniques for maximizing your parts cleaning and maintaining your machine. Preventative maintenance suggestions to prevent downtime. On-Line Operating Manual and CD Operating Manual allow distribution of this knowledge base throughout your organization. The comprehensive manual includes safety, start-up, theory of operation, operator adjustment & use, advanced operations, chemical planning & use, maintenance, and troubleshooting. On-Site Training: Professionally designed training and instructional designs are reviewed and approved by a Doctor of Education. Our training techniques apply pedagogical principals to step by step instructional modules for adult learners. Our Service Techs deliver the Parts Washer Training during our field start-up service or as a refresher course. The DVD training program is designed to train the new operator who has little or no experience with a StingRay Power Washer. 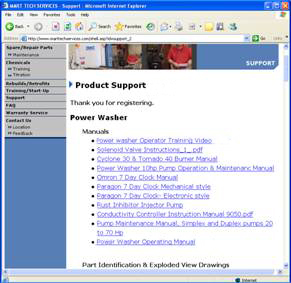 The video lessons are designed to demonstrate basic StingRay Power Washer operations and maintenance. Each chapter is packed with the information that a StingRay machine operator needs to know to be highly effective. 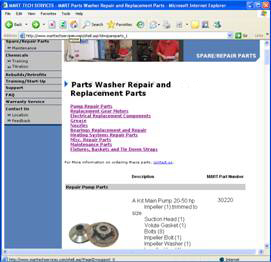 The DVD video is accompanied by a parts washer operator reference guide designed to match the content and sequence of the video instruction. The guide is used by adult learners to enhance their understanding and provides permanent information from the training video that they can take with them. The Reference Guide restates fundamental points and key information, reinforcing the learning and improving retention. DVD video parts washer training for new employees. For less than one third the price of a service call your operators maximize the productivity of your machine investment. Protect your investment: Operators learn the proper way to operate and maintain the machine for long productive life. Cleaner parts. Operators that know the correct loading and operation of the machine will maximize the StingRay technology resulting in cleaner parts. Save thousands in downtime. A properly maintained machine requires fewer repairs and operates when you need it instead of breaking down at random. Save money by quickly getting new operators properly trained so they use the equipment in a highly productive manner with little or no supervision. On-site service by our Factory Trained Service personnel teach your operators and maintenance people the proper operation, chemical maintenance and machine maintenance. Knowledgeable well trained workers maximizes the return on investment in your Parts Washer, assure long service life and maximize parts cleaning. Knowledgeable detergent and chemical specialist have experience with hundreds of applications just like yours. They are just a telephone call away or view the information on-line at your own pace at our user support website. Contact us today for all your StingRay Parts Washer repair, parts, and service!